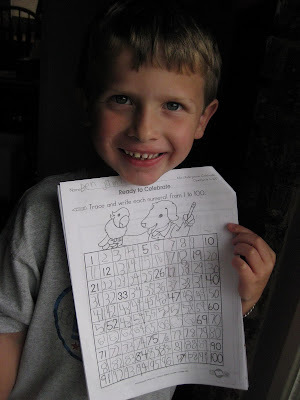 Please allow me to brag for a moment about my five year old son Benjamin, who wrote the numbers one to one hundred, all by himself. The only person more proud than I would be Ben himself. He requested that I photograph it and place it here for the world to see. So here you are world! Benjamin, my boy wonder! Yea for you, Ben! Great job! That sure is a lot of numbers! Yeah Ben! That's fantastic - I don't think I have ever done that in my entire life! I'm wowed!